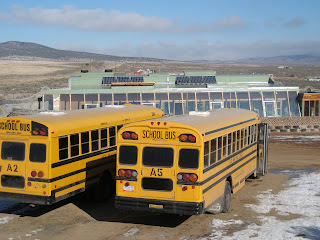 We got a chance to give the new Earthship Education Facility a little trial run this morning as part of a 3 hour scheduled tour for Vista Grande High School, a local Taos charter school. 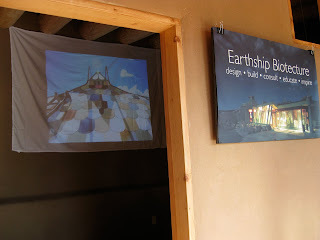 I set up a temporary screen (read white sheet) in what will be the screening room of the new Earthship Education Facility and showed some slides. 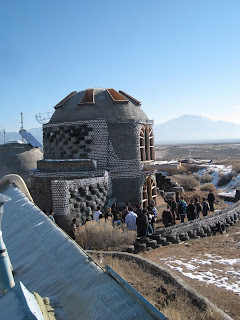 Sean and Hillary took the 60 kids through the vintange Visitor Center, around the EVE project, through the Studio rental, a one bedroom Global Earthship, the Corner Cottage Earthship, the Euro Earthship and the Phoenix. 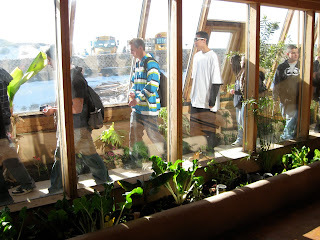 The kids got to experience passive solar/thermal mass in action because it was a frigid winter morning and the buildings were toasty warm inside. They took pictures and notes and learned about our solar and water systems. They were impressed with the food growing in our interior planters. I will let you know when we get feedback from the group. A big tour for a big group! 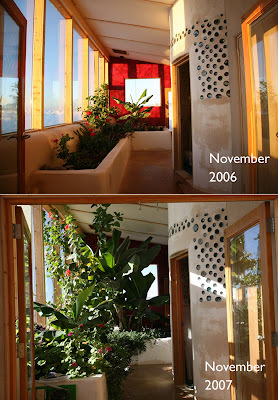 Here's how my gray water planter looked when I got back from working on the Brighton Earthship last year. 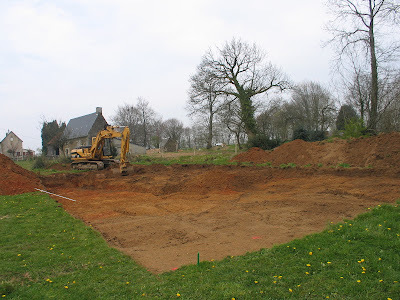 Then, below, how it looks now. Lush! 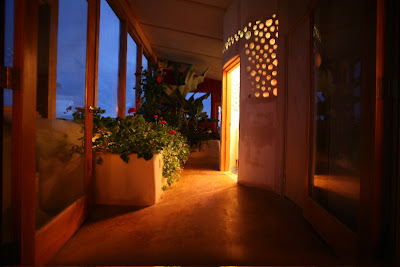 The latest additions to my Earthship: thermal shades on all the windows, track lights above the kitchen and a hanging light above the table. 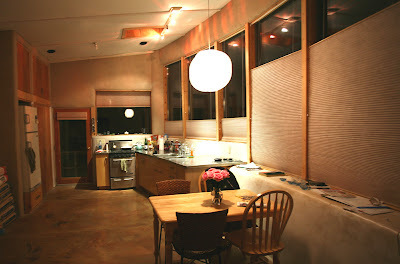 The shades are fantastic, keeping the heat in at night and shading the counter during the day. 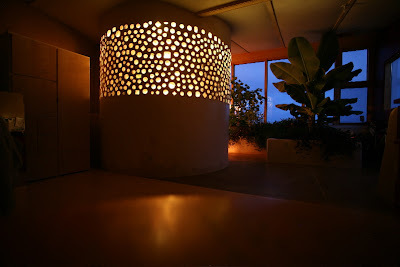 You can make any lamp into a DC lamp to run off of the solar system in your Earthship. You do need to have a DC circuit in place to wire into. 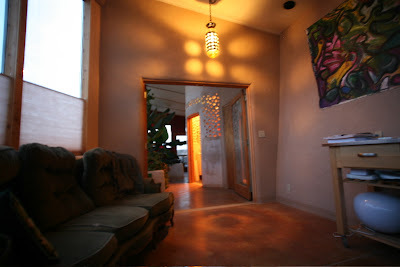 I bought this glass and metal lamp at a yard sale six years ago, waaaay before I finihsed my house. If you have DC monkey face outlet you can just snip the plug off any floor or desk lamp and rewire the end with a DC plug, put a DC bulb in the socket and VOILA! you have DC lamp. 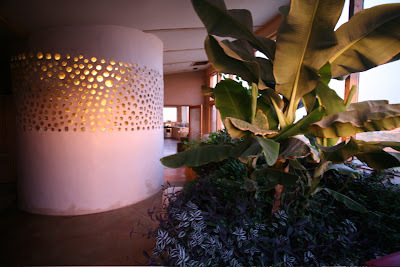 In this case we wire directly into the ceiling and put a 25W DC bulb inside. 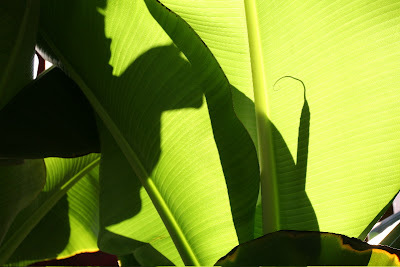 My banana trees in the bedroom are touching the ceiling. The planter has just gone crazy in less than a year. 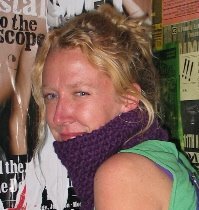 We are moving in to winter and I live in a tropical jungle...with no heating bill. A lovely, warm June evening up in the high mountain desert...Am rocking my solar powered wifi internet radio over my 8 car stereo speaker system (100% solar as well just like every other light and electronic in my house). Can't stop taking pictures of my bottle bathroom!! 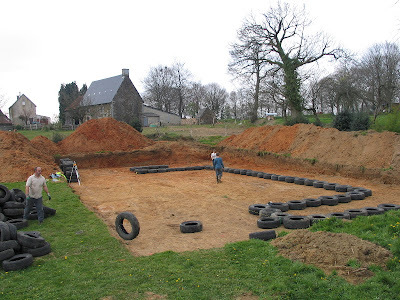 Ron and I arrived in Normandy this past Monday (April 9th). 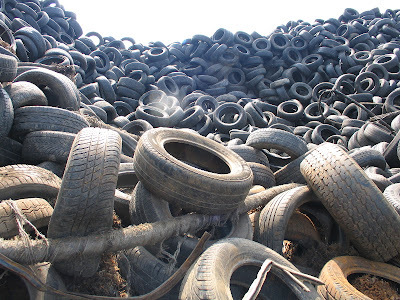 Tuesday morning we went with our host Kevan Trott to a local tire dump which received 30,000 scrap tires a week! 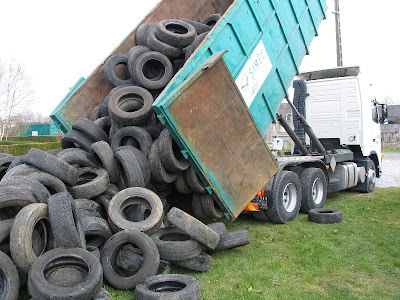 It took us two days of sweaty stinky labor to collect the 700 tires we needed for the house!